Abstract It is well known that the GNSS (Global Navigation Satellite System) signals are affected by the dispersive ionosphere, when the signals pass through it on their way from the transmitter to the receiver. The impact of the ionosphere is an error source that is usually eliminated in the ground based GNSS navigation applications and in the retrieval of the characteristics of the neutral atmosphere from the RO (Radio Occultation) soundings. However, both RO soundings and ground based GNSS observations can also be used to monitor the characteristics of the ionosphere and the plasmasphere. RO soundings for ionospheric tomography were proposed for the first time already in 1988 (Austen et al. 1988). The first demonstration of the soundings were performed by the GPS/MET mission. Many other RO missions (Oersted, CHAMP, SAC-C, and GRACE) have also included ionospheric soundings into their mission objectives. IOX (Ionospheric Occultation Experiment) was a dedicated ionospheric RO instrument onboard the PICOSat satellite. The ongoing FORMOSAT-3/COSMIC mission has already provided over 800 000 ionospheric soundings during the first 14 months of the mission. The new data produced by the GNSS soundings has generated significant advances in the radio science of the Earth's atmosphere and the ionosphere. Global coverage and continuous data production have enabled new types of services providing information about the status of the ionosphere in NRT (Near Real Time). Some emerging applications of GNSS observations include e.g., regional high resolution ionospheric tomography and monitoring and prediction of ionospheric scintillation. This paper gives an overview of the scientific achievements with the ionospheric RO soundings from the past and from the current RO missions, and discusses the prospects of the GNSS "space weather" applications in the near future. "Space Weather" is a generic name for the variations caused by the solar wind in the electromagnetic and the particle environment in the Earth's ionosphere and magnetosphere above the height of 100 km. Space weather effects may impact also the lower ionosphere below 100 km, e.g., during proton events, causing polar cap absorption and changes in the upper atmosphere chemistry. Space weather is driven by the Sun. Thus, also the disturbances caused by the space weather follow the 11 year solar activity cycle. Currently the solar activity (the number of Sun spots) is very low, i.e., we are at a solar minimum. The next solar maximum is expected to take place in 2011/2012. At the moment we cannot reliably predict whether the next solar maximum will be stronger or weaker than the previous maximum in 2001. The official prediction issued by the Solar Cycle 24 Prediction Panel is available from the NOAA (National Oceanic and Atmospheric Administration) SWPC (Space Weather Prediction Center) web page (http://www. swpc.noaa.gov/SolarCycle/SC24/index.html). Space weather impacts the human activities in many ways. The most obvious dangers are of course the solar radiation and the charged particles damaging the Earth orbiting satellites or an interplanetary spacecraft. The radiation and the particles can also endanger the health of the humans during a spaceflight. The danger from the solar radiation and the particles is significantly bigger outside the Earth's magnetosphere, i.e., in a spacecraft on the way to the Moon or to other planets. Space weather can also damage ground based systems on the Earth through electromagnetic induction. Space weather events can also cause problems in commercial aviation by disturbing HF and VHF radio communications at polar regions and by increasing the radiation doses of the crew members of the high flying aircraft. The final report of the COST 724 action defines the "space weather" as Space weather is the physical and phenomenological state of natural space environments. The associated discipline aims, through observation, monitoring, analysis and modelling, at understanding and predicting the state of the sun, the interplanetary and planetary environments, and the solar and non-solar driven perturbations that affect them; and also at forecasting and nowcasting the possible impacts on biological and technological systems (http://cost724.obs.ujf-grenoble.fr/). RO soundings of the planetary ionospheres and the interplanetary plasma fit very nicely to observation and monitoring aspects of this definition. In this paper, the focus is especially in the observation of the ionosphere of the Earth. Jet Propulsion Laboratory (JPL) in 1963 (Kliore et al. 1964). The result of these two proposals was the establishment of a collaborating experiment team for the NASA Mariner 3 and 4 missions. This collaboration between JPL and Stanford University continued over 20 years developing "radio science" as a technique for planetary exploration. A more detailed history of the early years of the RO soundings is presented in Melbourne et al. (1994). The sounding of the Earth's ionosphere with the GNSS observations was first introduced in 1988. The ionospheric soundings were included into a memo written by Dr. Gunnar Lindal in the framework of the preparation of an instrument proposal for the NASA Earth Observing System (EOS) (Lindal 1988). Almost simultaneously a paper envisioning ionospheric tomography with multiple observations of the Earth satellite links was published (Austen et al. 1988). Despite some setbacks due to e.g., changes in the NASA program plans, these two publications led into series of publications and proposals to promote RO soundings (e.g., Yunck et al. 1988; Yunck and Melbourne 1989; Melbourne et al. 1994). The starting point of the first RO demonstration mission was a proposal submitted to the National Science Foundation (NSF) in the US by a group at the University Corporation for Atmospheric Research (UCAR). With the support from NSF and with co-sponsorship by the US National Oceanic and Atmospheric Administration (NOAA), the Federal Aviation Administration, and the Orbital Sciences Corporation, the GPS/MET mission was initialized. The launch of the GPS/MET instrument onboard NASA's MicroLab I spacecraft took place in April 1995. The history of the neutral atmosphere soundings by RO and many details of e.g., the GPS/MET mission are described by Yunck et al. (2000). It is important to note that the ionospheric soundings have been included into the mission planning from the beginning of RO. The GPS/MET mission already included dedicated ionospheric measurement campaigns e.g., in October 1996 and in January 1997. Ionospheric soundings have been performed more continuously in later RO missions like CHAMP, SAC-C, and GRACE. The most comprehensive amount of ionospheric soundings has been naturally provided by the ongoing, multi-satellite FORMOSAT-3/COSMIC mission. Table 1 lists the past RO satellite missions and their status. It should be noted that both Oersted and SUNSAT had severe technical problems with their RO receivers and very little useful data was generated (but both missions were highly successful in their other objectives). Both UCAR (University Corporation for Atmospheric Research) and JPL have archives containing data from the RO missions in which they have been involved. These data are available for free for registered scientific users. The name of the UCAR data archive is CDAAC (COSMIC Data Analysis and Archive Center) and it can be accessed over the Internet (http://cosmic-io.cosmic.ucar.edu/cdaac/index.html). The JPL RO data archive is called GENESIS (Global Environmental & Earth Science Information System) and it is also accessible over the Internet (http://genesis.jpl.nasa.gov/zope/GENESIS). The data from the GRAS instrument is disseminated in NRT to the EUMETSAT user community. Scientific users can also access the archived data via the EUMETSAT UMARF (Unified Meteorological ARchive Facility) service (http://www.eumetsat.int/). The achievements of the ionospheric RO soundings naturally include all observations of the interplanetary plasma and the ionospheres of the planetary bodies. Some of the early achievements of the radio science have already been noted in Sect. 2. The use of RO soundings to monitor the ionospheres of the planets is far from over. For example Hinson et al. (2007) have recently presented new results from observing the neutral atmosphere of Mars and Hausler et al. (2006) have published results from the Venus Express Radio Science Experiment (VeRa) onboard the Venus Express spacecraft. RO soundings have also been used to observe the characteristics of the plasma turbulence in the solar wind (e.g., Chashei et al. 2005). This section provides a look at the achievements of the ionospheric RO soundings in the monitoring of the Earth's ionosphere and the plasmasphere. This discussion includes also the monitoring of the ionosphere with ground based GNSS observations, because it is very often necessary or at least useful to combine these two types of observations. The combined data provides a better coverage and potentially provides a better resolution e.g., in ionospheric tomography. One aspect that has significantly contributed to the success of the RO science for the Earth is the open source data policy that has been adopted by most RO missions. This policy was started by the GPS/MET experiment. The opportunity for the whole scientific community to access and "play" with the GPS/MET data was an important factor for the success of the mission. Without doubt the possibility to use GPS/MET data in research projects also triggered quite a few new scientific careers. The basic application of the ionospheric RO soundings is clearly the possibility to measure the vertical electron density profile. This measurement shares the same benefits and drawbacks as the RO soundings of the neutral atmosphere. The vertical resolution provided by the ionospheric RO soundings is in principle very high. However, the retrieved TEC (Total Electron Content) values represent an integral of the electron content over a very long horizontal propagation path. In neutral atmosphere the pressure dependence of the atmospheric refraction index makes the inversion of the measurement time series into a vertical profile relatively easy. In the case of the ionosphere, the inversion of the measured TEC to a vertical electron density profile can be performed by using an assumption of a spherical symmetry (Lei et al. 2007). However, in the presence of horizontal electron density gradients, this technique will produce only an approximation of the true profile. Taking additional information about the horizontal structure of the ionosphere into account makes the inversion significantly more complicated. In this case the inversion requires the use of a background electron density model (e.g., Heise et al. 2002; Jakowski et al. 2002; Stolle et al. 2004). 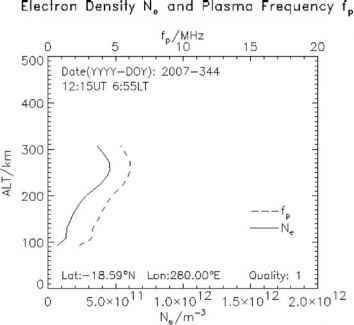 An example of electron density and plasma frequency profiles retrieved from a CHAMP sounding is presented in Fig. 1. 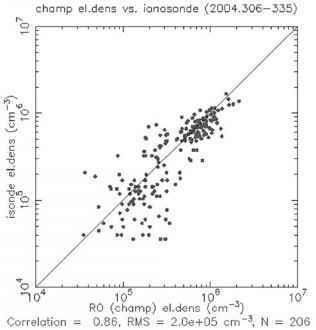 An example of an intercomparison of electron density retrievals from CHAMP RO soundings and collocated ionosonde observations is provided in Fig. 2.
plasmasphere. The zenith GNSS observations can be used to calculate the TEC above the spacecraft and they can also be assimilated into an electron density model for ionospheric tomography. Ionospheric tomography is a research field that has gained significantly from the development of the GNSS. The most significant advantages of the GNSS observations are the global coverage and the continuity of the observations. For example, the network of the observing stations in the IGS (International GNSS Service) provides globally GPS tracking data sampled as minimum at 30 s intervals (Dow et al. 2005). Many IGS stations provide currently also observations at 1 Hz sampling. IGS observations are used by many groups and institutes to retrieve global TEC estimates. Also IGS products available through the IGS website (http://igscb.jpl.nasa.gov/) include global TEC maps. However, high resolution ionospheric tomography is difficult by using only ground based observations. A possible approach is to combine spaceborne RO soundings with the ground based observations (e.g., Jakowski et al. 2002; Mandrake et al. 2004). The horizontal resolution of the ionospheric tomography can be improved significantly by using dense regional GNSS networks (e.g., Luntama et al. 2007). The research on combining ground based observations from dense regional networks with the spaceborne RO soundings is ongoing. In addition to the ionospheric electron distribution profiling, new innovations to take advantage of the ionospheric RO soundings are continuously coming up. An example of a new idea is e.g., the detection of the sporadic E-layer by monitoring the amplitude data from the RO soundings (Viehweg et al 2007). Another interesting new area is the "GNSS reflectometry". Using the reflected GNSS signals to determine the wind speed over the oceans and for ocean surface altimetry has been demonstrated with real RO data (Beyerle et al. 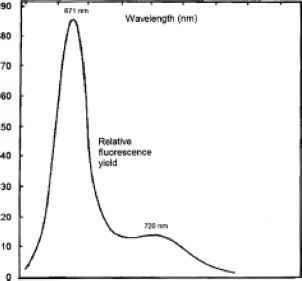 2002; Gleason et al. 2005; Yunck and Hajj 2005). To use the reflected GNSS signals also to measure the electron density distribution in the ionosphere has been proposed by Pallares et al. (2005). Another area where the ionospheric RO soundings have made a big impact is the development of the ionospheric models. One reason for this is that the GNSS applications also need the support of the ionospheric models to mitigate the error caused by the ionosphere in the navigation applications based on single frequency GNSS receivers. The continuous development of the ionospheric "climatology" models like IRI (International Reference Ionosphere), NeQuick, and GIM (Global Ionospheric Mapping) is potentially very useful for the single frequency GNSS applications. All these models can also be driven with observation based input parameters. This means that the models can be used to pass the observed ionospheric characteristics to the users globally or regionally. GNSS observations have driven also the development of ionospheric models for data assimilation. The basic need has been the feasibility to combine the ground based and the spaceborne GNSS observations with the other types of observations. The development of the physical based models is still very much ongoing, but some models are already rather advanced. Two models under development in the US are both called GAIM (Global Assimilation of Ionospheric Measurements). One GAIM model is being developed by the JPL/USC (Wang et al. 2004) and the other one by the Utah State University (Schunk et al. 2004). Another model that has been used in data assimilation is the PIM (Parametric Ionospheric Model) (e.g., Daniell et al. 1995; Stankov et al. 2007). Observation of the ionospheric scintillations is an area that has not yet been much addressed with RO soundings. One reason for this is that the measurement of the scintillation characteristics is not easy and the spaceborne RO receivers have not yet been specially designed for this purpose. Amplitude variations in the CHAMP RO soundings have been analyzed and compared to the scintillation observations in the satellite telecommunication links (e.g., Wickert et al. 2004). New results from the scintillation monitoring from the COSMIC mission have recently been presented by Starks et al. (2007) in the AGU 2007 Joint Assembly. the ionosphere in the real time. This is very important because the ionospheric conditions affect the satellite applications like telecommunications and satellite navigation. The research to use the GNSS observations to predict the ionospheric storms and scintillation is ongoing. and plasmaspheric electron density. This activity is based on combining spaceborne ionospheric GNSS observations with the PIM model (Heise et al. 2002). The future of the RO science looks very promising—at least from the point of view of the signal sources. The GNSS (Global Navigation Satellite System) is expanding with three new satellite constellations. Russia is gradually upgrading the GLONASS system into a fully operational status with 21 active and 3 in-orbit spare satellites. China is rapidly developing the Compass navigation satellite system that will include 30 MEO (Middle Earth Orbit) satellites and 5 GEO (Geostationary Earth Orbit) satellites. Finally, EU has recently agreed on the final funding to fully deploy the Galileo satellite constellation with 27 operational satellites and 3 in-orbit spares. With all four satellite systems fully operational, the RO community will be able to enjoy an environment with more than 100 satellites transmitting signals suitable for RO soundings. This is of course feasible only in the case that all GNSS systems are open for civilian use. The multitude of the GNSS constellations creates naturally also challenges. The spaceborne RO receivers should be designed to take advantage of all GNSS constellations. At least that would maximize the number of observations per receiver. However, it is not yet clear if the compatibility is sufficient to allow designing of spaceborne receivers that can use all future GNSS satellites. Another promising indication for the RO community is the very positive signal from the NWP users. The results from assimilating the CHAMP and the COSMIC observations into the NWP models have been very promising (Healy et al. 2005; Healy and Thepaut 2006; Luntama et al. 2008). One result from this success has been that the EUMETSAT user community has given RO soundings a high ranking in the Post-EPS candidate mission assessment. This is a very strong message supporting the continuity of the RO soundings in the EUMETSAT mission framework. However, the ionospheric user community should ensure that their requirements are properly taken into account in the RO mission planning. The EPS GRAS mission shows that it is possible to design a mission that provides an excellent service to the NWP users, but very little for ionospheric user community (Luntama 2005). Recent results from the regional ionospheric tomography show that the RO soundings are needed to support the ground based observations (e.g., Luntama et al. 2007). Even dense ground based GNSS networks cannot provide enough observations to allow the retrieval of the electron density maps with a high vertical resolution. Currently the number of RO soundings through a regional tomography grid is unfortunately limited to a few observations per day. A large number of GNSS satellites and a constellation of RO satellites would increase this number significantly. It is fairly safe to assume that the need for ionospheric monitoring information will increase in the near future. The first reason for this is that at the moment the solar activity is at its minimum (http://www.swpc.noaa.gov/SWN/index.html). With the increasing solar activity over the next 4-5 years it can be expected that the disturbances caused by the solar events in e.g., the satellite communication links will increase. The second reason for the growing interest for ionospheric information is the increasing number of GNSS applications and users. Especially the users of the single frequency GNSS receivers will notice the increasing solar activity as degraded positioning accuracy and as an increasing number of navigation problems. This user community will benefit from the services providing real time user warnings and ionospheric forecasts of degraded navigation conditions. The professional users for high precision or safety critical GNSS applications will almost certainly need precise and reliable information about the moments when navigation performance can be degraded due to the ionospheric disturbances. Even with the multi-frequency GNSS receivers and the navigation augmentation systems like EGNOS (European Geostationary Navigation Overlay Service) and WAAS (Wide Area Augmentation System) a transient problem like the ionospheric scintillation may cause a complete loss of the GNSS signal temporarily. The services described above already give an indication of what the potential prospects for the ionospheric RO soundings are in the near future. The operational applications will require high accuracy and near real time data processing and dissemination. These requirements are actually the same that are applied to the NWP systems today. So, one of the conclusions is that the collection, archiving, and dissemination of the space weather observations should be organized in the same way as the meteorological observations are organized. This means that an operational organization should carry out the baseline satellite missions and take care of the data dissemination. For some observations this is already true (e.g., the space weather instrument onboard the GOES satellites and the most recently the SEM (Space Environment Monitor) instrument package onboard the Metop satellite series). For the ionospheric RO soundings the continuity of the measurements is not as certain. A number of RO missions are currently planned (ROSA, GOCE, KOMPSAT-5, Post-EPS), but it is not certain if ionospheric soundings are included into the mission planning. Coordination of the potential next generation RO sounding missions (e.g., ATOMMS, ACCURATE, CICERO, COSMIC-2, CHAMP-2,...) would be very important also to improve the temporal and the spatial coverage for the high resolution regional ionospheric tomography applications. Another great challenge for the future of the RO soundings will be the data policy. The open source data policy adopted by the most RO missions this far has been very successful. It is not clear if the same approach can be continued in the future, when the operational users will form a large part of the RO user community. The problem is that there will always be a part of the user community (scientific users) that will not be able to pay for the observations. It also seems that the trend at the moment e.g., in the meteorological observations is that the raw data should be available for the users for free. So, the data policy for the future RO missions should be considered very carefully. A number of scientific challenges is still left in the ionospheric RO soundings. The first challenge is the monitoring of the local plasma bubbles causing ionospheric scintillation. Detection of the small scale structures will most likely require combining the RO soundings, the ground based GNSS observations, and potentially other types of observations. It may also be necessary to adjust the characteristics of the RO receivers to improve their scintillation measurement capability. Combining the GNSS observations with the other types of observations will require development of the data assimilation techniques. Combining different types of observations will most likely also require development of the physically based models for the ionosphere and the magnetosphere. This would presumably be the best way to develop more accurate nowcasting and forecasting techniques for the space weather applications. For the ionospheric RO sounding community this means close collaboration with the traditional space weather community to trace the origins of the ionospheric events back to the source, i.e., the Sun. A particular challenge in nowcasting is that observations will have to be disseminated to the users with a very small latency (typically 5-15 min). This will make the design and the implementation of the mission ground segments more demanding. The short history of the RO science in the monitoring of the Earth's atmosphere and the ionosphere is very impressive. It is likely that the experience from the planetary RO science has contributed to this. In any case, huge advances both in the RO science and in the infrastructure have been reached in a rather short time. It is very impressive that ten RO missions have been accomplished over the last 12 years. The future of RO looks bright. The GNSS is getting bigger and better. Thus, the lack of signal sources should not at least become a problem for the future RO missions. The third frequency in the next generation GNSS satellites can potentially further improve the accuracy of the ionospheric soundings. However, many challenges are related to the evolution of the GNSS. The compatibility of the different GNSS elements may become an issue, especially with spaceborne instruments. The political and legal constrains may also become more important in the future. In meteorological applications RO has matured into one of the baseline observations required by the NWP users. A good indication of this is the high status given by the meteorological users to the RO soundings in the ranking of the EUMETSAT Post-EPS candidate missions. This is good news also for the users of the ionospheric soundings, because both soundings can be performed with the same instrument. It is just the task of the ionospheric user community to ensure that their requirements are taken into account in the RO mission planning. The applications for the ionospheric RO soundings will most likely become more operational and require NRT dissemination of the data and the products. This will create more challenges for the ionospheric sounding missions. Coordination in the mission planning, in the data processing and in the data archiving will be very important. Also the access of the scientific users to the archived data will have to be organized. These challenges are linked to the data policy issues. The past success of the RO science has been very much based on the open source data policy adopted by the most RO missions. This policy should be continued at least for the scientific use of the data. 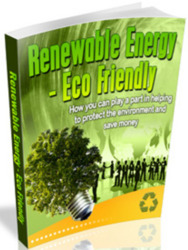 For commercial applications the data policy has to be considered very carefully. Finally, an important area of activity for space agencies in the near future is the "space situation awareness". This means the capability of monitoring what is happening in the near Earth space. For example in the case of satellite failure, the space agencies will want to know if the failure was caused by natural events, space debris, or if it was caused intentionally by somebody. Nowcasting and forecasting space weather will be one aspect of this activity. The ionospheric RO soundings will certainly be a part of the observation system required for space weather prediction. Combining the RO soundings with other types of space weather observations will require development of the data assimilation systems and most likely physically based ionosphere and magnetosphere models. These activities will require a close cooperation between the RO and the other space weather science communities. Links to the NWP community will also certainly be useful to benefit from their long term experience in the development of the data assimilation systems. Yunck TP, Hajj GA (2005) Atmospheric and ocean sensing with GNSS. In: Reigber C, Lühr H, Schwintzer P, Wickert J (eds) Earth Observation with CHAMP, Results from Three Years in Orbit, Springer, Berlin Heidelberg, pp 421-430, doi:10.1007/3-540-26800-6_67 Yunck TP, Melbourne WG (1989) Geoscience from GPS tracking by Earth satellites. In: Proc.